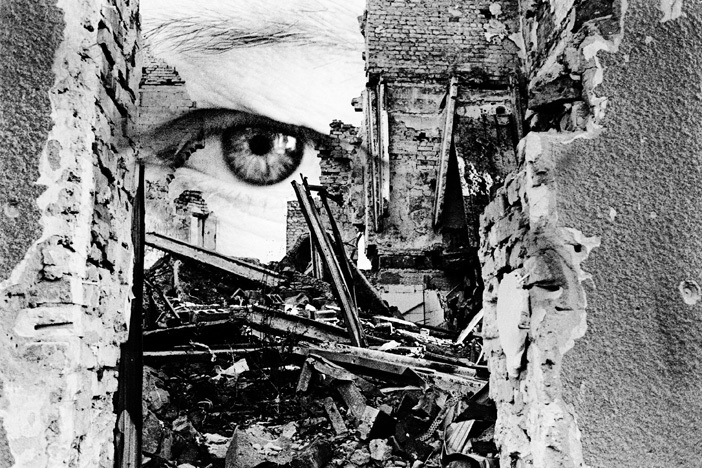 A double exposure with the eye of Mr. Alexander Hug, Principal Deputy Chief Monitor of the OSCE Special Monitoring Mission (SMM) to Ukraine until the end of October 2018, and buildings destroyed by the war in Eastern Ukraine. The SMM monitors the situation in Ukraine with a staff of 1248 people and regularly compiles reports about their work in Ukrainian, Russian and English. The OSCE Special Monitoring Mission aims to monitor the situation in the Ukraine and to facilitate the dialogue among the people. The Minsk Agreement to resolve the war in Eastern Ukraine includes 13 points. Which of these thirteen points has been fully implemented from SMM's point of view so far? Alexander Hug: First of all, it is important to know that there are seven Minsk agreements because the later agreements regulate some of the aspects of the earlier agreements in more detail. The Special Monitoring Mission in particular looks at security and humanitarian measures and you can see it in our reports that these measures - at best - have been only partially implemented. And especially the important security measures, this means the withdrawal of heavy weapons, for example, artillery, tanks and multiple launch rocket systems have only been partially implemented. We speak about this in our reports in a very clear language. Another point is the so far incomplete effort to remove landmines as it was set out in the Minsk agreements. Instead we see and report that mines are still used on a regular basis.Until today there are ceasefire violations and especially in the past days we registered violations in four-digit numbers per day. There has been not a single day without ceasefire violations since we started recording violations. How are you monitoring the occupied territories of the Ukraine DNR, LNR and in particular the border between Russia and Ukraine? Does your mission have access to all areas in the war zone? Alexander Hug: The border between Russia and Ukraine not controlled by the Ukrainian Government, is around 400 km long. The SMM regularly monitors this border and reports on it. We cannot work there truly independently, as we have to pass multiple checkpoints on our way to the border and so people at the border know when we are arriving. When we arrive at the border, armed men often tell us to move back. We cannot set up a permanent presence near the border, for example, in Novaozovsk, Antratsyt or Amvrosiivka, either. We have to go back to our base before sunset. So the time spent at the border is very limited. However, we still see quite a lot at the border. We see civilians crossing, we see buses and trucks crossing, but we have no mandate to control these vehicles meaning to look inside these trucks. We also use technical equipment to observe the area of the border in particular during the night and we saw convoys of vehicles crossing the border on dirt roads away from the border crossings points. What is the point of conversations and agreements if no one complies with the agreements? Alexander Hug: There is one thing that is difficult to explain. And this is to measure the effectiveness while the fighting is still going on. And the problem is that you can't measure the absence of violence because it is not there. At the same time we can speak of certain containment as the conflict has not spread further and deeper into Ukraine. It is very difficult to make the case that the Trilateral Contact Group in Minsk or in fact our work has contributed to it because it is difficult to prove - it isn't there. What is visible and what is there, that is the continued fighting. Not only in my view but also this is the opinion of my colleagues it is certain that this conflict ultimately can only be resolved through dialogue. And the Minsk platform is one possibility for such dialogue. We, as a Mission outside the framework of the Minsk agreements, based on our own mandate, we facilitate dialogue on the ground that leads to significant improvements for civilians: We facilitate dialogue that enables the repairs of gas, electricity and water infrastructure and the delivery of humanitarian aid. It also proves that dialogue on the ground actually leads to an improvement. Yes, this is often only a treatment of symptoms because the root causes, which are the military reasons or the political reasons on another level, are, of course, not addressed. But not having a platform for dialogue equals giving in to violence. And dialogue is the only means available to change what is now a military logic, driven by political decisions, into a civilian logic. Who benefits from the now four-year war in Ukraine? Alexander Hug: I have a very quick answer: No one benefits from this conflict. Do the talks and negotiations between the respective warring parties take place only at a military level, or are there civil agreements between the two sides? Alexander Hug: First of all, it is Moscow, Kyiv and certain areas of the region of Luhansk and Donetsk that have signed these seven agreements. All of them have a responsibility to implement what they have promised to. That is very important to know. On the ground, it is possible to reach arrangements via indirect dialogue that we facilitate, so that critical infrastructure, humanitarian aid and even the recovery of the dead can be enabled. Again, this only works if dialogue happens. Especially an indirect dialogue because there is still an issue of direct communication among the sides which we don't want to judge. However, we stand ready to facilitate dialogue with the help of our staff present on both sides of the contact line. How does the civilian population in the war zone react to the military? Alexander Hug: Civilians tell us without exception that it is not their conflict. And that they don't understand why this is continuing or why it is not stopping. And the only thing they want is that it stops. Do you have any insights into how the respective sides are dealing with prisoners of war? Did you question prisoners? Alexander Hug: We do not systematically interview people deprived of their liberty. We have done that when we gained access to them on both sides of the contact line. However, we facilitate access to people deprived of their liberty to members of the Trilateral Contact Group and we cooperate very closely at all the levels with the United Nations Human Rights Monitoring Mission. And we have a sophisticated system through which we can channel request from relatives or people deprived of their liberty themselves to organizations such as the UN. And quite importantly, the International Committee of the Red Cross with whom we cooperate also on both sides of the contact line. Every day, thousands of people pass checkpoints between Ukraine and the occupied territories. Can not this passenger traffic also mean a possibility of reconciliation and understanding between the both sides? Alexander Hug: First of all, it is very important to say that areas on both sides of the contact line are part of Ukraine, one is not under control of the Ukrainian Government, the other one is. The fact that up to 40.0000 Ukrainians cross the contact line every day is a positive phenomenon which you don't normally see in conflicts. Normally the contact line is a division line, where people are separated. So, in Ukraine, there is a clear indication that people don't believe in this line. The line hasn't been there before. It is not something natural, it has been drawn on the map. It is a hard reality for the people on the ground but in their minds the line doesn't exist. This is where investments should be made, one should take care of Ukrainians on both sides of the contact line because they are those ones who will support a solution that will bring peace. And they are also the future as they live there and rebuild their lives again in this area. And we are talking here not just of tens of thousands of people, there are millions of people that are affected by this. What are the dangers and risks faced by children in Eastern Ukraine on a daily basis? Are schools or facilities attacked where children are staying because military is nearby? Alexander Hug: In fact, we do see on both sides of the contact line that military hardware is placed close to residential areas that sometimes include schools and other institutions. Sometimes these schools have been abandoned and are not any longer used - sometimes not. If there is a position close to a building then that position - even it is not fired from - becomes a target. And if weapons are used from this position then it will draw counter-fire. As the weapons used in this conflict are imprecise, it is highly likely that the buildings around, which could be schools or kindergartens, are being affected. Another big risk for children are mines and unexploded ordnance. And there are a lot of non-exploded rounds that lie around. These are metallic, shining objects on the ground and young kids are interested in them, they pick them up and try to dismantle them and they explode in front of their faces. At best they lose their limbs, at worst they lose their life. And there is the risk of being caught in crossfire, especially close to the contact line. The war in Ukraine was from the beginning a media war, too. Against this there is your work, which reports unprejudiced and impartial on a regular basis about the happenings. How do the opponents deal with this and are the reports of the OSCE exploited by the respective conflict parties? Alexander Hug: We have long made it at one of our main arguments that facts matter. Because we do believe that those, who have committed themselves to end this madness, need objective and precise facts to make decisions. The decisions should not be based on rumors, on propaganda or speculation. They should be based on very precise and clear information. And we provide this information. It is not the whole reality because we are prevented of seeing everything. But even the things we do see are sufficient enough. So if they would be considered the situation would dramatically improve. The sides in this conflict don't have a system through which violations of their agreements can be checked or investigated, and where people in charge are held to account. This doesn't exist in this conflict. And there is no systematic mechanism through which preventive actions are being taken. This is something which could be installed on the basis of our reports. It is correct to say that sometimes the facts that we produce are selectively picked and then used to point the finger at the other side. Pointing fingers or trying to figure out who has shot first had been undertaken for four and a half years and it is obvious that finger pointing has not led to any result. The focus should be on finding measures to address the violations that we register. One says, the first casualty of war is truth. What truth did you yourself draw from the war in Ukraine? Alexander Hug: Well, what is the truth or not this is a big philosophical question. We prefer to stick to the facts. And fact is that those who committed themselves and claimed that they are protecting people don't seem to produce actions that actually substantiate their claim. They continue to lay mines, they continue to use heavy weapons. This is not a speculation, one can read it in our reports. The other relevant fact is that in many incidents the promises that have been made by the signatories, that is Moscow, Kyiv and certain areas of Luhansk and Donetsk, are repeatedly and openly breached. This is also documented in our reports. And what is important is that these facts do matter. And the people responsible could make decisions and we know that it is absolutely in their hands as there is no hate group dynamic underlying this conflict; it is a purely political-driven decision-making process. Unfortunately, this process does not currently factor in the violations that we reflect: 200 civilian victims (37 deaths and 163 injuries) and almost 3,000 weapons in violation of signed withdrawal agreements this year alone. If these 3,000 weapons would be locked up behind the withdrawal lines then they could not be used any longer. That would lead to a change. So, if our facts would matter to those who take decisions then the lives of civilians and the whole situation would improve.